An original letter of correspondence between brothers and business partners Joshua Coffin Chase and Sydney Octavius Chase. 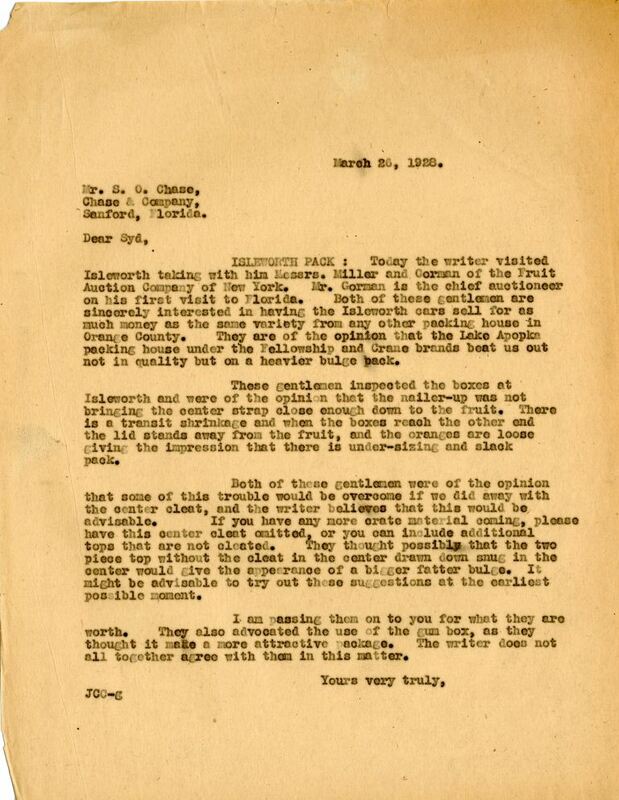 Topics discussed in the letter include Joshua's visit to Isleworth Grove with Mr. Miller and Mr. Gorman of the Fruit Auction Company of New York and suggestions for improving fruit packing. Original letter from Joshua Coffin Chase to Sydney Octavius Chase, March 26, 1926: box 49, folder 20.84, Chase Collection (MS 14), Special and Area Studies Collections, George A. Smathers Libraries, University of Florida, Gainesville, Florida. 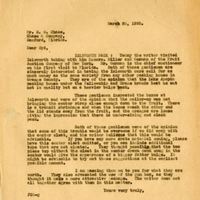 Digital reproduction of original letter from Joshua Coffin Chase to Sydney Octavius Chase, March 26, 1926. ISLEWORTH PACK: Today the writer visited Isleworth taking with him Messrs. Miller and Gorman of the Fruit Auction Company of New York. Mr. Gorman is the chief auctioneer on his first visit to Florida. Both of these gentlemen are sincerely interested in having the Isleworth cars sell for as much money as the same variety from any other packing house in Orange County. They are of the opinion that the Lake Apopka packing house under the Fellowship and Crane brands beat us out not in quality but on a heavier bulge pack. These gentlemen inspected the boxes at Isleworth and were of the opinion that the nailer-up was not bringing the center strap close enough down to the fruit. There is a transit shrinkage and when the boxes reach the other end the lid stands away from the fruit, and the oranges are loose giving the impression that there is under-sizing and slack pack. Both of these gentlemen were of the opinion that some of this trouble would be overcome if we did away with the center cleat, and the writer believes that this would be advisable. If you have any more crate material coming, please have this center cleat omitted, or you can include additional tops that are not cleated. They thought possibly that the two piece top without the cleat in the center drawn down snug in the center would give the appearance of a bigger fatter bulge. It might be advisable to try out these suggestions at the earliest possible moment. I am passing them on to you for what they are worth. They also advocated the use of the gum box, as they thought it make a more attractive package. The writer does not all together agree with them in this matter. Chase, Joshua Coffin. “Letter from Joshua Coffin Chase to Sydney Octavius Chase (March 26, 1926).” RICHES of Central Florida accessed April 19, 2019, https://richesmi.cah.ucf.edu/omeka/items/show/2727.